Accents can be used with most stains colors or wood species. After the wood is stained, we apply by hand the special accent finish to add a shadow effect in the crevices without significantly altering the look of the base stain. 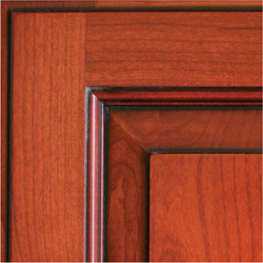 This technique is used to enhance, with a darker or lighter color, all grooves that occur on doors, panels, mouldings or most other pieces that are accented. Glazing is an artistic, hand finished, process that adds depth and dimension to most paints and even stains. This technique uses a special finish material that is applied over the entire painted surface then hand wiped to give it a subtle hued finish. The glaze coating will soften the original base color of the cabinets, while highlights create the effect of greater depth. Our glazes are available in a color ranging from light brown to black. 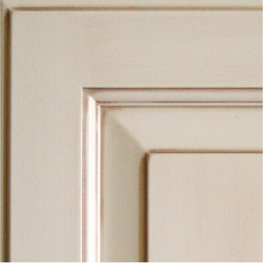 Accented Glazes use both the Glazing and Accenting techniques described above, thus highlighting to an even greater degree the surfaces, edges and grooves of your cabinets. Both Accents and Glazes, this is an artistic, hand finish that can be used over most paint colors. 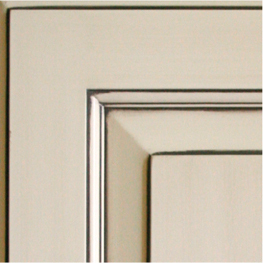 The finish techniques are layered on top of each other therefore encompassing the characteristics of both finish methods. 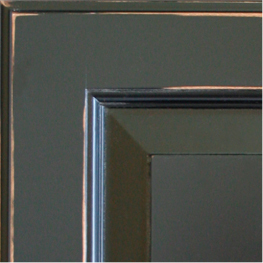 The rub through procedure (our most labour intensive artistic finish) gives the illusion of time worn painted cabinets. The sealer and paint is rubbed off and the wood lightly scuffed before the final top coat is applied. The rubbing pattern will differ from one door to the next, giving each a unique look. This finish process, as well as the others above, is described in greater detail in our Finishes and Expectations brochure.